← Save Lady Moody’s House! If I share this story you might think me guilty by association, especially since I’m Gravesend’s self-elected cheerleader, but the crime happened eighty years ago today, so I should be safe. 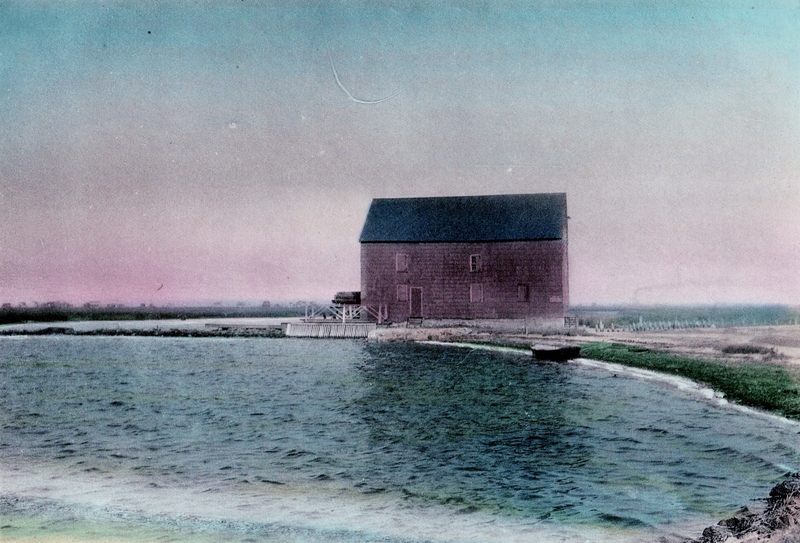 “Gerretsen’s [sic] Mill at Gravesend,” image from Charles Andrew Ditmas, Historic Homesteads of Kings County (1909). When I began to research Gravesend history seriously about twenty-five years ago, I showed my late granduncle some book or other of old Brooklyn photographs. He was well over seventy then and enjoyed recalling the Brooklyn he moved to as a teenager from Manhattan, around 1932, with his parents, five brothers, and only sister (my grandmother). Thumbing through the pictures, he stopped at one of Gerritsen’s Mill, as rickety a building as ever there was. It stood on the west bank of the Strome Kill (Dutch for “storm creek”), also called Gerritsen’s Creek, the tidal inlet that formed a natural boundary between the historic towns of Flatlands and Gravesend. The creek survives in truncated form south of Avenue U in Marine Park, but the mill is gone. Detail of a map of Gerritsen’s mill pond from Reginald Pelham Bolton’s 1922 “Indian Paths in the Great Metropolis.” The mill is circled in red. Note the bridge carrying Avenue U over the pond. Uncle Frank wore his bifocals oddly, with the tops tilted way forward. He lifted his head back to see me through the bottoms of his lenses and said, matter-of-fact, “You know, I burned that thing.” My jaw dropped. When we think of the Netherlands we conjure up tulips and windmills. But the Dutch who settled western Long Island did not use windmills to grind grain. Instead they built dams across the tidal creeks that fringed the marshy coastline. As the tide flowed in the water level rose behind the dam. When the tide ebbed, the receding water forced the flood gates shut. The trapped reservoir, or mill pond, could then be channeled as needed over a paddle wheel to turn the gears and grindstones inside an adjacent mill. Hugh Gerritsen owned land at the Strome Kill before 1645. But while it is believed that the Gerritsen clan first operated their tide mill that long ago, the first definite, historical reference we have to its existence is in the 1765 will of Johannes Gerritsen, who bequeathed it to his son, Samuel. Legend has it that during the Revolution, Samuel, rather than grind grain for the Hessians, submerged his millstones in the creek. Forced at bayonet point to retrieve them, he unwillingly served the enemy for the duration of the war. The historians Charles Andrew Ditmas (1909) and Maud Esther Dilliard (1945) have detailed the genealogy of the Gerritsen property and its long-running mill, which fed Gravesend and the surrounding towns into the 1890s. It passed in 1899 to William C. Whitney, former United States Secretary of the Navy during Grover Cleveland’s first presidency (1885-1889). Whitney’s son, Harry Payne Whitney, trained racehorses on the grounds. The Coney Island Jockey Club’s track at Sheepshead Bay was quite near. By the early twentieth century the abandoned mill had become a picturesque backdrop for the sightseers who posed for photos in front of it, and, sadly, a destination for souvenir hunters who took away pieces of history in the form of nails and bits of timber. When the City finally acquired the Gerritsen-Whitney property to create Marine Park in 1925, the mill was a wreck. Preservationists called it the oldest surviving tide mill in the country. “It is a sacrilege for our generation to allow this relic of Revolutionary days to crumble into ruin,” cried Gertrude Ryder Bennett to the editor of the Brooklyn Eagle on Wednesday, June 24, 1931. The City listened. A fence went up around it to keep what remained of the mill intact. Plans were drawn — see “Gerritsen Mill, Old Landmark, To Be Rebuilt” in the Brooklyn Eagle, August 26, 1934 — and the exterior carefully restored. But then, on September 4, 1935 — tragedy. An early-morning fire destroyed the ancient building. The cause of the blaze was never determined. Some have speculated that it was set by a disgruntled employee of “master builder” Robert Moses. 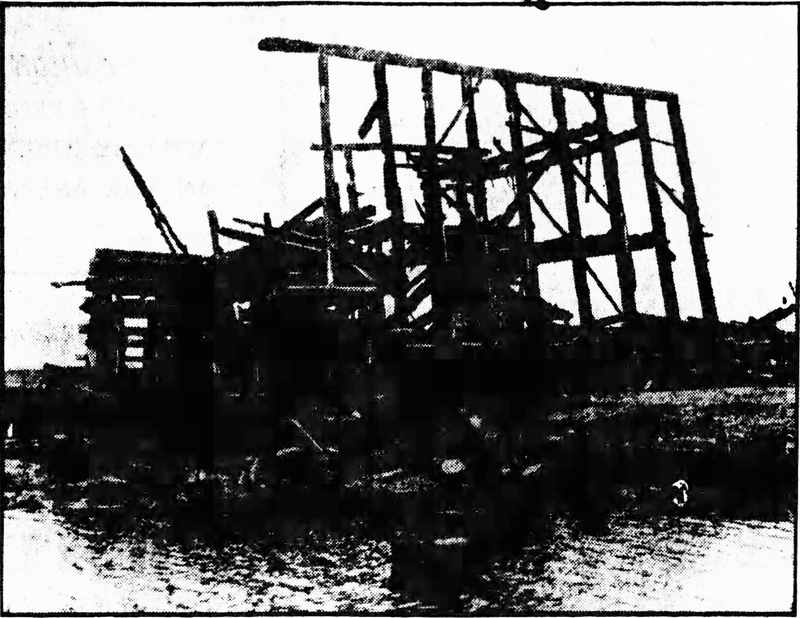 The charred remains of Gerritsen’s Mill. Photograph from the Brooklyn Eagle, Wednesday, September 4, 1935, p. 13. Do I believe my uncle really had a hand in it? Who can say? He had no reason to invent such a tale. Back then, he was nineteen years old and had a bit of a wild streak in him. (When the family still lived in Manhattan, he was off one day on a bicycle ride. He got struck by a car and landed in the hospital. This happened just when they were poised to move to a new apartment on the opposite side of Thompson Street. No one knew where he was, so the move happened without him. Somehow, he got out of the hospital and made it home, only to find that home had left him behind.) He could very well have been in Marine Park, goofing off with friends in the tall, dry grass. A single spark from a match — flicked deliberately or not — would have been enough. An abandoned grindstone, very likely from Gerritsen’s Mill, survives somewhere in the marshy reaches of Marine Park. And the mill’s foundation, along with the pilings that formed its dam, remain visible at low tide. These traces, and two relics — a hand-forged iron nail and a wooden peg — preserved by someone who picked them from the ruins and fixed them in a shadowbox, are all that is left of Brooklyn’s first industrial plant.